From here we start getting to the good stuff. You will now really begin to see your book taking shape as you format your book in Word. If you have a fictional book, it’s not necessary to make the pagination changes. The Widow/Orphan control is selected by default, and that is suitable for fiction. If you have a non-fiction book, I recommend making the other changes as detailed below. Open your saved Word file, i.e. if you’ve following the steps in this blog. Open the Paragraph window, by clicking the Paragraph button in the bottom right-hand corner of the Paragraph menu frame (see below). Widow/Orphan control. A widow is the last line of a paragraph printed by itself at the top of a page. An orphan is the first line of a paragraph printed by itself at the bottom of a page. This option is turned on by default. Keep with next. These are for paragraphs you want to keep together on a page. This can be useful with non-fiction books, when you want your reader to keep her train of thought across pages. Keep lines together is similar to the above feature, but will keep the last paragraph together, i.e. if your last paragraph could run over onto the next page, when you choose this option, all the lines in the paragraph will remain together. This aids reading, especially non-fiction. Check the Widow/Orphan control (if not checked) and the Keep lines together checkboxes (for non-fiction). Page break before. This is usually used with headings, e.g. if you always want a Heading 1 to start on a new page, then set this feature on the Heading 1 style. For example, chapters usually start on a new page. To set this option, type “Heading 1” (you can actually type anything you like). Select the heading and then open the Paragraph window (as above), and tick the Page break before checkbox. We want this setting to be applicable to every Heading 1 style used in the book, thus we need to change the Style setting. Use the steps for Setting your Base Font in the previous post. You don’t need to use the settings shown below. From your book design checklist, you will know how many chapters (or Parts) your book has. If you do not yet know how many chapters your book has, it’s no problem, you can insert section breaks as you go along. It just saves time if you insert all the chapter section breaks at once. 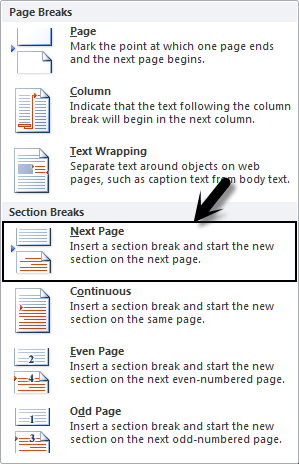 Whenever you want a different header, footer, or page layout, you need to use Section breaks. For example, the header for each chapter is usually different, and the layout on Part dividers is different. The following diagram illustrates where Section breaks will be inserted. Look confusing? Don’t worry; we’ll go through the steps soon. 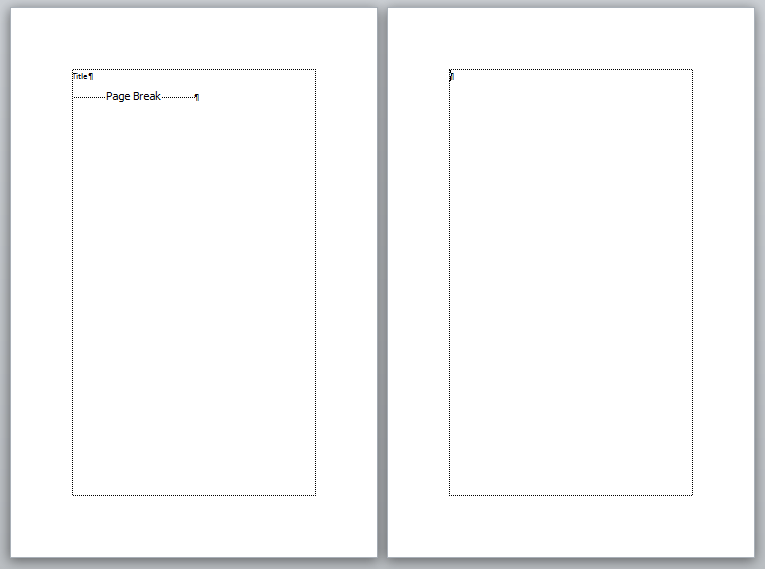 The blank page after the Title page. The blank page after the Half Title page. The blank page after the Copyright page. The blank page after the Dedication page. The blank page after the Table of Contents page. The end of each Chapter (note that a new Chapter starts on a right-hand page). Before and after each Part divider (if you have Parts). Click the Show/Hide button if it’s not turned on. You’ll see all sorts of weird symbols and spots in your document, but no need to worry – they don’t print. Anywhere on the first page type Title, press Enter and then Ctrl + Enter (to insert a manual page break). 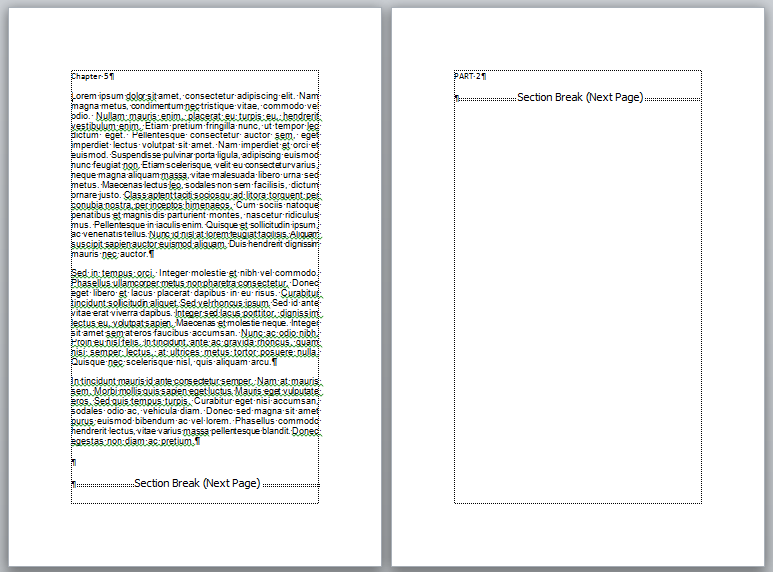 You will now have your Title page and a blank page (see example below). With your pointer on the blank page, press Enter (i.e. you need two manual line breaks). Click the Page Layout tab, and then open the Breaks drop-down menu. In the Section Breaks section, click Next Page. You will now have your Title page, a blank page, and another blank page. You will see the Section break on your page (Show/Hide must be turned on). On the third blank page type Half Title, press Enter, and then Ctrl + Enter. Now you have five pages: Title, blank, Half Title, blank, blank – and on this page type Copyright. Press Enter twice. And now you have: Title, blank, Half Title, blank, Copyright, blank. With your pointer at the top of the sixth (last) page, press Enter. At the top of this page type Dedication. Press Enter twice, then Ctrl + Enter. With your pointer at the top of the eighth (last) page, press Enter. At the top of this page type Table of Contents. Press Enter twice, then Ctrl + Enter. With your pointer at the top of the tenth (last) page, press Enter. At the top of this page type Chapter 1. Press Enter twice, then Ctrl + Enter. With your pointer at the top of the thirteenth (last) page, press Enter. Repeat the above four steps for each of your chapters. In your example Word file, add 5 Chapters. You should now have the following pages: Title, blank, Half Title, blank, Copyright, blank, Dedication, blank, Table of Contents, blank, Chapter 1, blank, Chapter 2, blank, Chapter 3, blank, Chapter 4, blank, Chapter 5, blank. If you have Parts in your non-fiction book, you need to insert a Section break before and after the Part divider. At the end of your chapter, press Enter to insert a manual line break. If your Chapter ends on a right-hand page, press Ctrl + Enter to add a blank page, and then proceed with the steps below. Type the name of your part, e.g. Part 1. The diagram below shows the section breaks at the end of the Chapter. The diagram below shows the section breaks at the start and end of the Part divider, and the next Chapter. The reason we do this is because the Part divider does not have a header or footer. Whenever you have a different or new section in your book (e.g. Front matter, Chapters, Parts, Appendix, Bibliography, etc.) each must be separated by Section breaks. The reason for this is because each will have a different header. We’ll cover this in detail later. Check back to this post for the Book Structure. With your page setup done, and all your sections in place, the first part of your global book design settings are done. Remember to save your example Word file. We’ll be working more on it in future posts. How do you like how your book is looking so far? Pretty neat, hey? In the next post, I cover Headings and Headers & Footers. The bottom line of my doc often has an extra space between words of varying lengths that I am unable to delete. Please advise. If I understand your query correctly, you have your text justified. And usually this occurs when there is a soft return at the end of the line. Place your pointer at the end of the end and press Enter (hard return). That should correct the bad spacing. Awesome post. You really helped me fix my manuscript. Much appreciated. Thanks. Glad to hear it helped.